Fort McMurray has known tragedy. The devastating fires that ravaged Northern Alberta over a 15-month period beginning in May 2016 destroyed some 3,200 buildings, forced the evacuation of over 88,000 thousand people and caused some $10 billion in damage knocked this community on its arse – to use the vernacular – but definitely not out. Its people picked themselves up, dusted themselves off and have started the long, difficult process of rebuilding. For Gary Harris, a second blow came with the unceremonious shuttering of Sears Canada. That process resulted in the loss of the Sears dealer store he had operated for over 20 years. He wasn’t ready to get out of the business and so looked for retail concept that could be successfully adapted to a community in the midst of rebuilding. 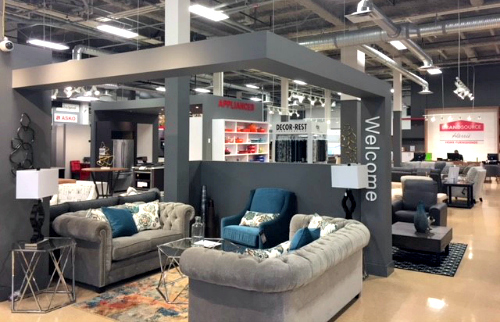 “With my experience in the market, I recognised the opportunity to open a new format store here in Fort McMurray that would cater to the consumer as a ‘lifestyle merchant’,” he told Home Goods Online, defining such a storeowner “as a retailer who understands the consumer, listens to what they want to achieve in their homes and helps them fulfill their dreams. The process he and co-owner and general manager Matt Creighton (he’s co-owner and managing director) went through resulted in the opening this past summer of Harris BrandSource, an 18,000 square foot showroom and warehouse located in the heart of Fort McMurray’s main shopping district. 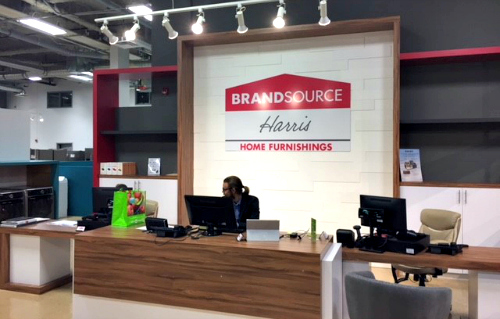 “We set about to make sure we fully understood the market and the vendor and product opportunities, Harris explained, adding he reached out to Don Burnett, banner director of BrandSource Home Furnishing – the primary go-to-market tool for Mega Group. They had known each other as Burnett at one time worked as part of the Sears Canada dealer store network’s management team. “I’ve known Don Burnett for a long time and learned to trust his knowledge,” he added. The store’s development began with the commission of a PRIZM market study, which was conducted by L’express Marketing, a Montreal-based consulting firm. The study’s purpose is to help retail store owners understand more about the market in which it operates as well as the customer it wants to attract. “The objective is to identify opportunities and guide marketing and communication strategies that will help retain and grow customers,” Burnett said. One of the first things discovered was Fort McMurray has one of the highest annual household incomes in the country – averaging about $95,000. Furthermore, household spending on furnishings and equipment was also amongst the highest in the country at $4,300 a year. The study also showed Fort McMurray was a digitally active market, “We noted a particularly high level of participation in social media,” Burnett said. For example, 34% of area residents are active on Instagram; another 34% can be found on Twitter and almost 47% have a LinkedIn account. Furthermore, 95% are active on the internet and, at any one time, as many of 16% of them were accessing home furnishings or home décor-related content (that’s higher than the national standard which is 11%).